Exactly 42 years after the building of the Berlin Wall, a German wants to re-create the wall in plastic - in the name of art. Arts promoter Christof Blaesius wants to rebuild the wall and have it decorated by artists from around the world. The idea is proving controversial. Not much of the Berlin Wall is still standing. 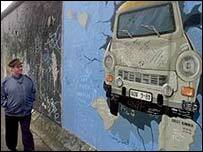 The biggest section has become known as the East Side Gallery, as it has become famous for its art-work. Mr Blaesius' idea is for a huge huge plastic screen, running right through Berlin along the entire original route. He wants to invite artists from all over the world to take part in his project - which will be ready in time for the 2006 World Cup. "I'd like to rebuild the wall in a very creative, modern and meaningful way," he said. "I think it's about 46km we have to rebuild." 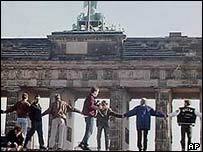 The Berlin Wall went up in 1961 virtually overnight. It became the most powerful symbol of the Cold War. "The former East Germany was a big prison because nobody was allowed to leave," says historian Hubertus Knabe. "If people, especially the young, tried to do it because they wanted to see something of the world, it was very, very dangerous for them." Wherever you go in Berlin there are reminders of the city's history, but it's hard to find anyone interested in bringing back the Berlin Wall - even in the name of art. "Maybe because I come from the East and I had to live with the wall, I don't want to see it again, not even as a colourful piece of art," one woman told me. "I think it's not necessary because people have the wall in their heads," said another. "It wouldn't convince me as an art project and it doesn't strike me as a strong poIitical gesture either," a Berlin man complained. The logistics involved in setting up a giant plastic screen would give anyone a headache. But the organisers say they've thought of everything. The tricky bit will be getting permission - and already Berlin City Council has said it's unlikely to back the new project.